We were recently set the task of devising an effective poultry sanitiser aimed at combating harmful bacteria, especially Campylobacter, in freshly processed poultry. After careful deliberation, we designed a machine that delivers a consistently high temperature of hot water to sanitize the bird. At L&G we design and manufacturer complete PLC Control Systems and PNID Control Systems for our bespoke Batch Fryers. L&G Engineering designed, manufactured and installed a heat pack for a high pressure, hot water washdown system, at high quality meat and poultry producers, Vion Food Group. 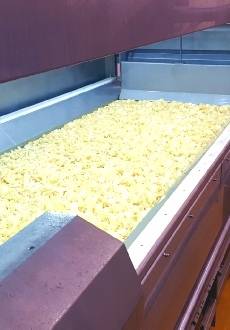 Our bespoke, commercial batch fryers, manufactured to the highest standards and specifications have been very well received both nationally and internationally. L&G's highly skilled engineers consider precision temperature control, oil flow, ease of use, clean operation and reliability when designing the fryers. One of our most recent examples of such a project is a new access gantry completed at the start of the year for a local food factory. As well as serving as an access platform, the gantry also carries service pipes around the building. With a broad range of engineering skills, including industrial gas registration and welding certification, we're able to provide a number of valuable services, from fabricating finely engineered, thermally efficient equipment for the Food Industry, to fire-fighting equipment for offshore installations. We engineer and install brewing equipment, provide steel structures for refurbishment projects and design bespoke fabrications across many industry sectors.